Florian Neufeldt (*1976, Bonn) is showing a new series of sculptures and objects which come together to close a circuit. The works have their origins in everyday objects, deformed and alienated until they lose not only their functionality, but also the connection to their past. Neufeldt’s sculptures remove the traces of their own origin, and with it the spatial and temporal links to a particular context. But small details lead the visitor back in time and provide access to a narration outside the realm of formal research. Cutting, folding, exposing, taking apart, connecting, Neufeldt does not leave the material alone. He looks for an independent form and exploits all the material’s weaknesses, to bend it, thicken it, distort it. Through these processes, things emerge which are alien to our world and which follow their own logic, a logic not immediately comprehensible and nevertheless, or perhaps therefore, so attractive to us. The power of his works is not limited to forces of attraction or gravity - even electrical energy is incorporated. 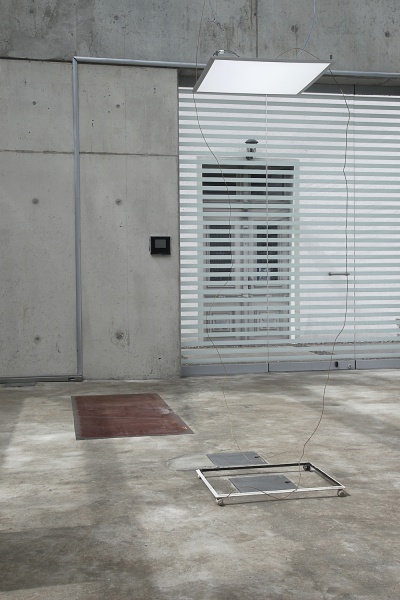 Exposed cables and hanging wires form a spatial drawing in the Lichthaus and join the building with the sculptures, connected to the electrical supply and to the metal of the works. With this connection, electricity can flow and provide energy for the lighting, which becomes an integral part of the works. Neufeldt draws on the lightness and openness of the architecture of the Lichthaus. During the day, the works harmonise in their tonality and form with the architecture. In the evening they autonomously rise up in their own spotlight. The presence of the sculptures, as well as the stance of the exhibition itself, are continually changing.